1) View the door bottom and determine the height to be removed across the bottom length of the slab. Get a sure, precise measurement. Look at the doors nearby. Determine how much light you want shining through. The edge should clear all flooring and swing completely open and closed. 2) Pop the door from its hinges, and if the pins are stuck, tap them through the bottom with a hammer and nail set. The pins can be greasy so you might want to place them on plastic. And mark the door end to be cut with blue tape. 3) Prop the door on a pair of trestles or other safe prop which should be protected so that the existing finish will not get damaged. Dense, low pile carpet is an excellent material to wrap the trestles. 4) Wrap the bottom circumference in 3/4" blue tape. Which will prevent splintering. Wider tape of course can be used. 5) Transfer the distance to be cut with a pencil onto the lower door edge. 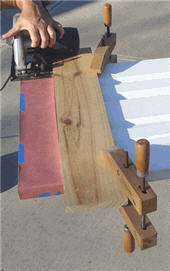 You may mish to use a T-square if you have one since the bottom may have not been cut square previously. 6) Wood clamp firmly into place the 1" x 6" guide across the door. Giving the proper set-back distance between the saw guide and the outer blade. Place a cut swath of the rosin paper or other protective wrap on the top surface and sides where the saw is to be run, securing it with tape. If you tape near the bottom edge (as pictured) then press it firm. Important - using the deeper 1" x 6" guide enables that the wood clamps be placed so that the saw motor will clear the clamps. Otherwise, on some circular saw models, make sure your that the motor overhanging the guard will not be obstructed by the clamps. 7) Saw the door bottom with the door being held into position, and for this you might want a partner to steady the door for when saw force is being applied. 8) Return the door to its hinge with the tape still left. Once you are sure there is an adequate bottom gap, release the tape gently. You may wish to pull the door and seal the bottom edge, and then let dry before putting the door back up, which will help maintain the shape. Prices for the front door. © 2000, 2001 - 2019 Referwork. All rights reserved.